Shadrach wrote: The team's home opener for tomorrow has been shifted to Concordia's new stadium and its artifical turf. 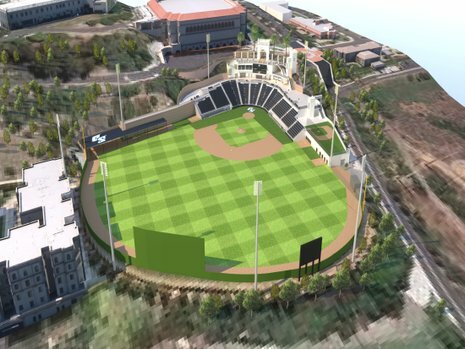 I realize this may be wayyyyyyy off into the future, but those preliminary expansion plans for campus show a new baseball stadium being built down by the river. Would artificial turf be the way to go? When you look at schools nearby (Oregon, OSU, UW, WSU, Gonzaga, and now Concordia) they all have turf baseball fields. I kind of like that we still use grass, but it seems like half (an exaggeration, I know) of a season's games are canceled due to "unplayable conditions." The team's home opener for tomorrow has been shifted to Concordia's new stadium and its artifical turf. Should be "muggy" with rain and temps reaching the low 50's. Artist's rendition; I think it's been too dark and rainy for an actual photograph since the complex became operational! 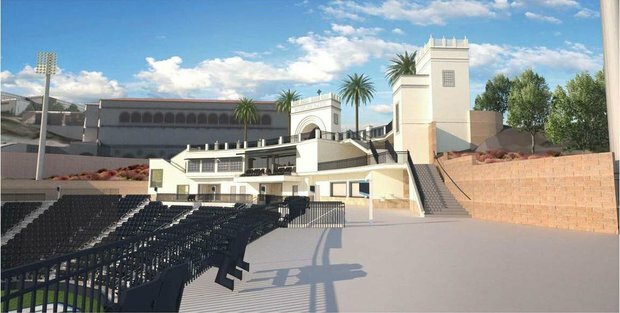 There are plans for a new stadium below the bluff, and probably sooner than you think. There are several items currently on the agenda the college wants to do and one of the first is the new finess center. Before that happens, Etzel field needs to go away. The waiting period for the EPA to release the ground down there is almost done, so don't be surprised if there is an announcement before the season is out. As to Turf, I'm pretty sure only the infield at OSU is Turf. Etzel has some of the wear areas aroundd the plate as turf already,[edit: yes, the outfield is Natural grass at Goss] Im sure they will consider that. God never intended for people to play America's game on plastic anyway. Besides, we hired a turf expert last year. We will need to keep him busy. 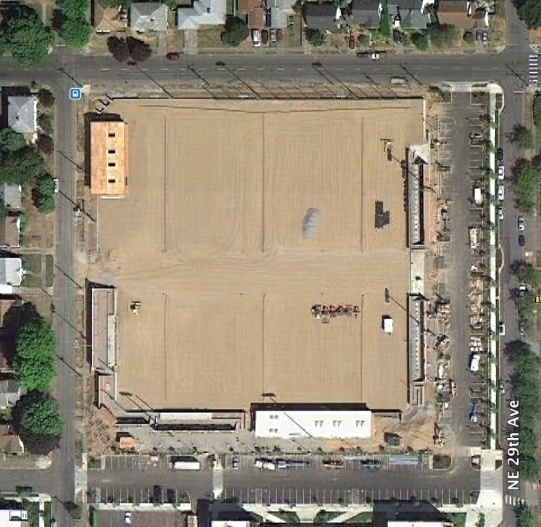 Looks like Google Earth did their flyover right when the fields were being laid. Ooooo... Now I'm all excited. I hope the new baseball stadium has video broadcast capabilities so that they can stream video from the games. That would be nice. Maybe also a roof over the seats. Maybe also a video screen to show players faces as they go up to bat! I never noticed the infield turf at Etzel field. Is that new? RipCityPilot wrote: Ooooo... Now I'm all excited. I hope the new baseball stadium has video broadcast capabilities so that they can stream video from the games. That would be nice. Maybe also a roof over the seats. Maybe also a video screen to show players faces as they go up to bat! Just right around the Plate (Foul territory) and those little paths to the dugout/on deck circles. Easy, dude. we are talking EPA. those dudes could take a century to get off their civil service duffs. They might rather retire and let the next generation take the heat for actually signing a document. I like grass and dirt fields when the weather's nice but I tell you what, turf is a very useful thing to have around here. These days lots of high schools are building turf baseball/softball fields and those save not only that school's season, but other schools in the area that can use it when it rains. Regular season games get moved to turf fields often but where it really helps in the playoffs. Two years in a row I've been on crews scheduled to umpire state high school softball playoff games at schools with grass fields. Both years my game has been rained out on the originally scheduled day and moved to a turf field the next day. Right now I can think of seven turf softball diamonds in the Portland area and the last two years we used all of them to get the playoff games in our area in. I think Portland could have a grass field if they can use Concordia's when they need it and it's available. Even if you don't have one yourself it's good to have one in town (especially a short drive from campus). Some good posts there with some good information and it is right on. The EPA finally sent comments last week on the proposed clean-up plan for the river campus that UP has been waiting for since last August. UP is required to submit a response to those comments so EPA can publish a notice in the federal register that the revised plan is ready for public review and comment. UP expects to have comments back to EPA in 2-3 weeks. The public notice period is 30 days with additional time for EPA to review any comments received before issuing UP an order to proceed. First up will be work on a few selected areas on the property (only a fraction of the property requires clean-up) and the start of prepartions/earthwork for a new baseball playing field and stadium. Expect to see a lot of activity down there this summer. 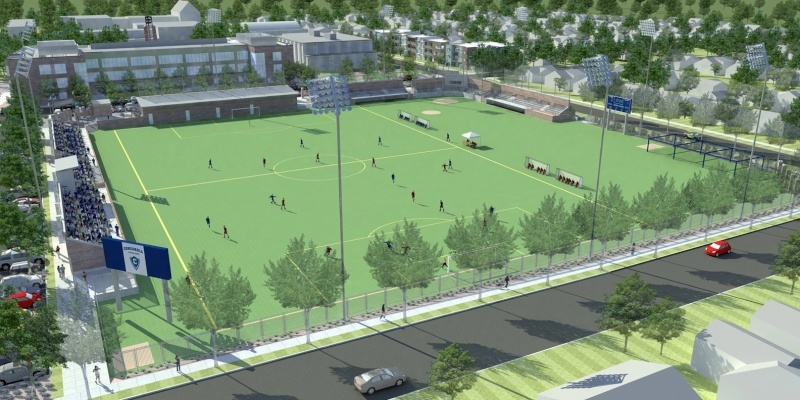 A new recreation & wellness center is scheduled for a ground breaking in summer 2013 on the current Joe Etzel Field site. (An architect rendering of the new rec center is available for viewing on the UP Facilities & Construction Dept. website). The Pilots will play the 2013 season at the new facility on the river campus. Lots of good work ahead in 2012 - 2013 but it is very exciting. Stay tuned for more information about this project over the next several months. While UP embarks on complying with the EPA order it is at the same time working on a new master plan application to be submitted to the City of Portland later this spring that will bring the river campus into a new UP boundary and set the stage for development of that property and the main campus for the next 10+ years. So you're saying if we have free time this summer, it might be worth it to spy on the river campus? That's exciting news. A new stadium by the river should be a great setting for baseball. It would be like the San Francisco Giants stadium in the home runs were hit into the water. But, that's probably not environmentally friendly. And, I don't know if a baseball stadium oriented that way would be sun friendly. It sounds like everyone wants a grass field, but the weather is not conducive to a grass field. The other option is artificial turf. What if I offer a third solution? Retractable roof! That probably only adds $100M to the final cost. I don't know how I feel about being a D-I school and having to ask an NAIA D-II school if we could borrow their field from time to time. We need a more permanent solution. I like the turf infield/grass outfield thing as a practical measure, but it looks horrible. I would rather it be all grass or all turf. Just don't make it look like that old UW field with the astroturf. Turf/Grass; I played on both surfaces while playing fast-pitch softball in the Air Force, and have no preference as long as the infield is DIRT and the temperature is not above about 85 degrees in direct sunlight. From a scheduling standpoint, TURF is the answer. From an esthetic, traditional, overall cost standpoint, GRASS is the only way. What does Coach Sperry think? What does our AD…….. (Oops, sorry). BTW: A quality field/stadium will greatly enchance recruiting; GU is a great example. Lots of great posts since my last visit. I am constantly impressed with the scope of knowledge and interest shown by PN regulars. It's been suggested that maybe I know a bit about what's happening with UP's new river campus. That is true. I can add a few things to the current discussion about the new baseball facility, timing, etc. but I cannot get in to specifics as no official and/or final decisions have been made on the project. But good people have been working diligently on the future of Pilot baseball and you all will learn more about the plans as the months unfold. Patience is a virtue but hard to harness. OK, here goes. Grass -v- turf: right now it's all grass for the new field. We've got the best guy in the NW and he will earn his stripes on this project. Consideration of elevations, flood plane, etc. all will be taken into account. Coach would also like a separate all-weather turf practice infield - and it appears he's being listened to. Staging: 2 options really. Playing field - season - stadium OR all at once. It all depends on fund raising. There is support for all at once but conventional wisdom says 2 phases. UP could bust it all if everything falls into place. Setting: the setting is spectacular and designers are doing their best to capture its natural beauty. Don't look for HR's into the river as setback requirements will mean a 600+ foot blast to right field. 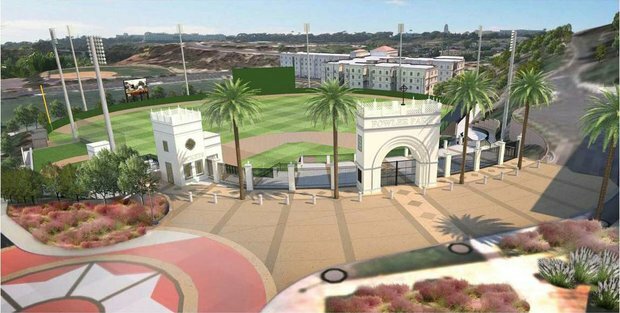 Expect grassy areas to play, picnic, watch the game, and kids chasing down home runs. Stadium lights will add night games and ease the schedule for student athletes. Stadium: someone already cited the Zags' stadium as a good place to start. That has been duly noted by the folks in charge. You can expect something really special. Modern turf works fine for baseball, is apparently much less expensive to maintain and probably leaves a little in the budget for other things . . . but are we to walk from the large parking lot to the field . . .? wrv wrote: "but are we to walk from the large parking lot to the field . . .?" Nope, there will be a parking area adjacent to the new stadium. It will be like Safeco Field because the retractable roof is going to cover the train tracks which will amplify the train noise right? 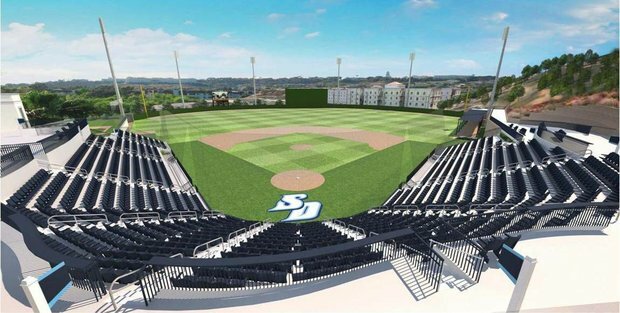 USD is renovating their facility for next year, as well... and it looks beautiful! 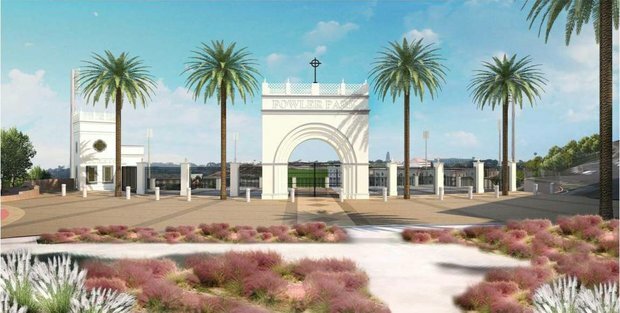 I dont think they have the same turf/grass concerns... Can we get some palm trees? Looks like foul territory is supposed to be Turf? And what the heck is that little diamond on to the building in left?...whiffle ball? And I wouldn't sit in back of Home Plate without a backstop. To help clear things up... we will not be adding an artificial playing surface on the new field due to the location being flood prone. It it does ever flood the little black rubber things would flow directly into the river causing a lot of trouble with environmentalists. We will have regular playing surface and the field will actually be built 6ft above the current ground level after placing enough dirt under it. Yes, that's a lot of dirt. Good idea river- and environmental-health wise. I hope this means we get an actual tarp to cover the field, though... or a better drainage system.